That’s…that’s a lotta wood, right there. It will become obvious what this is about. Guess what yesterday was? Another column Sunday. But unlike most of my published stuff, the topic was a little more sensitive than the usual “bumbling through cultural differences” affair. I wrote a version of this piece a few months ago, and was intending to keep it off the blog and save it for the book (which is literally going nowhere right now) because it reveals more than a little bit of vulnerability. GOD FORBID. Essentially it’s about the difficult adjustment that comes with making good, reliable friends from scratch, after having lived in one place all my life. Over the six months between April, when I originally penned this, and now, obviously my situation has changed somewhat and I’ve got the benefit of a little bit of hindsight. So read on for a glimpse into my psyche. Be gentle with me. Before I moved to Maine, I had no idea what constituted the unit of measurement known as a “cord.” I’d read the term before, so I understood it had something to do with wood, but it was hard to visualize it. That was until Tuesday, at least. 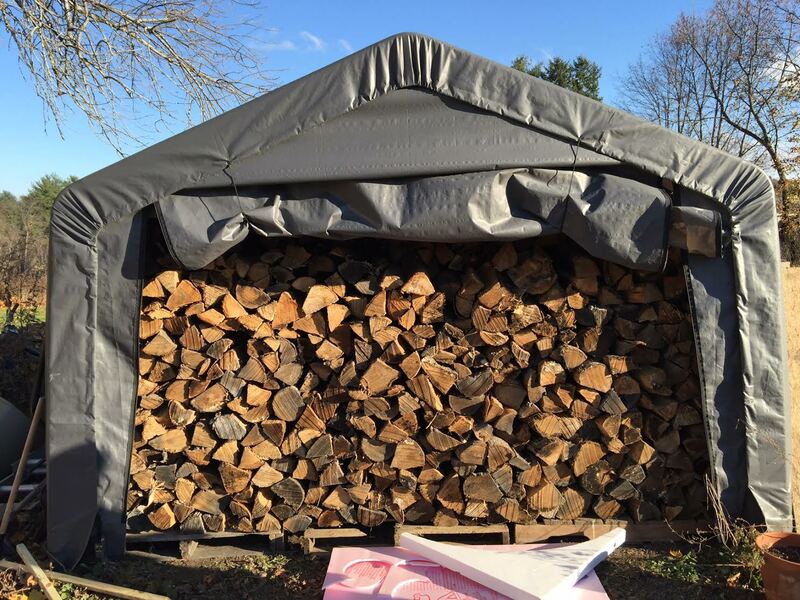 I spent a good three hours on the morning of Veterans Day helping a friend move about five cords’ worth of firewood. For many years I’ve thought the two best high-water tests for the strength of a friendship were, “Would I drive them to the airport?” and “Would I help them move house?” After Tuesday morning’s effort, I now know there’s a third. I don’t know if I’ve ever mentioned this in this space, but I’m not from around here. I’m definitely not from a climate that requires a wood-burning stove during the winter, so it stands to reason that I’ve never cut, moved or stacked firewood for a second in my life. Last Sunday night, though, I offered to do just that. As I was perched at the bar watching the Packers wipe the floor with the Bears on national TV, I heard the bartender, Dan, with whom I’ve become friendly after virtually putting his kids through college one beer at a time since December, talking about his Tuesday morning plans to move his firewood delivery under cover before winter set in. Being in reasonable shape and a second-shift worker with nought to do on a holiday morning before work, I offered to give him a hand. Why not, right? So I showed up bright and early-ish in what I thought would be my best late-fall, wood-moving clothes (a flannel shirt, boots and gloves) ready to get going. I arrived even before Dan’s former roommate, who conveyed his surprise that I’d even shown up at all for what promised to be a day of hard toil. But I’ve always prided myself on being true to my word, and while the potential column material was just as big of a lure as the promise of payment in pizza and beer, the universal currency, the thing that really drew me in was the camaraderie. You see, along with winter car maintenance, health insurance and other forms of bureaucracy, another hurdle I never really anticipated when I moved here late last year was how to make friends. Now, before I go on, I swear this isn’t a woe-is-me tale, or one designed to elicit sympathetic social invitations. But those who’ve made a big move in their lifetime would know that building a base of friends from scratch is considerably tougher than I expected it to be. After 28 years of living in the same city I grew up in, and working with largely the same people for seven years, I had a big group of friends who were good for a variety of different social circumstances. There were those with whom I’d have a big night out on a weeknight, or others who were up for a Saturday brunch or to catch a movie on some random weekday. Looking back, it’s amazingly easy to be complacent about having people in your life who are literally just a text message away if you want to hang out. And while I’ve met a lot of great people here and made friends who’ll certainly be meaningful in my life long after I mosey on out of town, I still don’t really have the hang of it. I’ve found that it’s like walking a tightrope. You don’t want to come off as aloof or too cool to hang out with people, but on the other hand if you’re too eager then it can reek of desperation. I’m far more uncomfortable with the idea of looking desperate or overeager, to the point where it’s probably been detrimental to my social life since I’ve been here. On my very first night out in Hallowell, four days after I arrived in Maine, a guy at the bar struck up a conversation with me after he noticed whatever I was reading at the time. We talked for awhile before he asked me what my plans were for December 23, and invited me to a Christmas party he and his roommates were throwing somewhere in Hallowell. I didn’t have a card to give him but he took my number and said he’d text me the details. I figured it was a token gesture or the result of a few too many pints, but sure enough I got a message a couple of days later letting me know where to go and when. I had to work until 10:00pm that night, and the action started at 6, so I told him I’d let him know how I was going after I clocked off. And sure enough, I didn’t. I was too nervous about showing up at a party full of strangers, too nervous about not recognizing the guy who invited me, too nervous about possibly accepting an invitation that was token rather than genuine. And with the beauty of hindsight, I know that was the dumbest thing I could’ve possibly done. I whiffed a shot at making a new friend my first week in town. Don’t get me wrong though: I didn’t arrive in Augusta expecting to have a crew of new pals by the time I’d unpacked my suitcases. I had no delusions that everyone I met, from workmates to strangers in the street, would immediately make room in their social lives for the guy who moved all the way from Australia to Maine in the middle of winter for some reason. On top of all this, I’ve got plenty of experience traveling alone, and for the most part I prefer it that way. I can go wherever I want at whatever time suits me. I can do as little or as much as I like on a day off. I’ve become truly content in my own company, so it’s been absolutely no big deal for me to sit at the bar on my own with a book while I have a meal or a beer after work on a Friday night. I’m also fairly confident socially, so generally when I go out for that after-work beer or a Sunday afternoon pint, I’m able to make “temporary friends” for that idle barroom conversation that amicably fills in the gaps. The drinking culture in the US is obviously very conducive to this as well, and as a very good worst-case scenario the bartender is often good for a chat. Slowly but surely, though, I’ve developed good casual friendships with the people I interact with frequently, be it in the office, at the bar or elsewhere. I’ve been invited to golf days, ice fishing trips and white water rafting excursions. Some I’ve been able to do, others I haven’t. Maybe it’s just that I’m one of those impatient Generation Now kids who wants everything to happen yesterday. Either way, I think it just proves the theory that anything worth having is worth working for. Even if it does involve a ride to the airport, helping someone move house, or lugging five cords of firewood and then being unable to roll out of bed the next day. Because sitting around on a bright November afternoon, having a beer after a hard day’s labor and feeling like “one of the guys” again, was worth every log. God. If this is a taste of your book’s quality, hurry up and finish already. Great read.